Transform a meager settlement into a mighty empire! 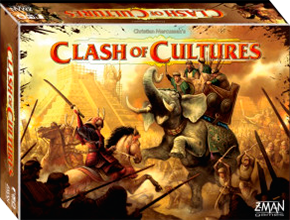 Many game designers have tried to tackle the ‘civilization-building’ genre of game design, but one of the most successful is Clash of Cultures, which distills the familiar elements of technological and cultural advances, empire expansion, combat and ‘wonder-building’ into an fun, easy to learn and easy to play experience. It’s by Christian Marcussen, the designer of Merchants & Marauders, and Z-Man has given the game the lavish production values it deserves. The little plastic pieces that fit together as you build your growing cities are a highlight. This summary includes the rules from the expansion, Civilizations. This game is just remarkable in its ability to envelope so many aspects of a civilization building game. Any chance for this got get an update including the expansion content? Yep, it’s coming very soon. Ahhh, no one ever says ‘please’ anymore! 😉 Almost done. Sorry, I’ve been really busy lately. But it’s on the to do list.